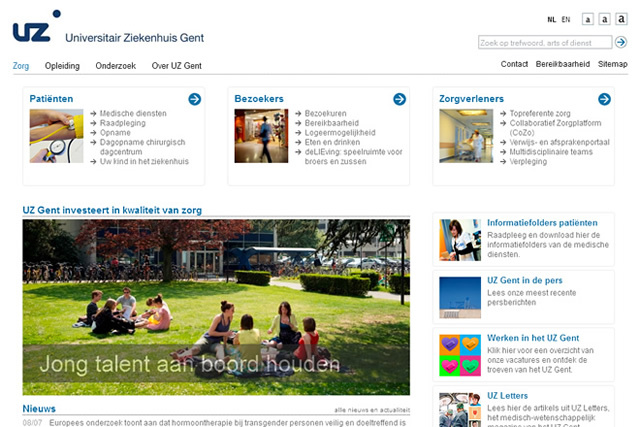 The homepage of the Ghent University Hospital website was overly crowded and busy. It contained a lot of text and an endless list of news article titles took up most of the screen real estate, ultimately drawing all the attention to itself. This made it difficult for visitors to find the correct place to start their journey to the information they were looking for. At the personal request of the then managing director of the hospital, I was entrusted with the task to clean up and simplify the home page design. By adding more white space and bringing back focus to the 3 target audiences (patients, visitors and caregivers), the page could hold more useful information, while, however, seeming a lot less cluttered. Note: Project as a full-time employee of UZ Gent. The website was recently completely redeveloped by a third party, but the “blocks” for the target audiences and reduced amount of news articles were kept.